Sonitum PC Headset has a built-in pivoting microphone that can be twisted and rotated to an angle, where your voice can be picked up loud and clear. Plus, it has the ability to reduce background noise, which makes it ideal for online classes, Skype calls, call & chat centers, webinar presentations, and more! Compatible With Most Software's And Hardware! Because this USB can be used with windows XP/Vista/7/8/10 so this works well with PCs and laptops with new operating systems. It also works fine with IOS and Mac OS, as well as Android tablets. Get this top rated PC headset device and experience a different realm of pure quality sound like no other.Hurry, order one today while supplies last! ★ VERSATILE AND MULTI-PURPOSE STEREO HEADSET - Sonitum PC Headset is a consumer favorite device for taking calls, listening to music, chatting and is even compatible with Skype. Though it's not a professional gaming headset it also works with most multimedia gaming machines. Compatible with almost all operating systems on PCs and laptops - Windows, Mac, and IOS & Android smartphones and tablets. ★ ACCOUSTIC NOISE CANCELLATION - Years of research were put into this amazing headphone to make sure it can deliver exceptional sound quality. No matter how noisy, windy, or loud your surrounding is, rest assured you will hear none of them. The Built-in unidirectional microphone with noises cancelling feature lets you listen to great music quality and lets you make phone calls that are clearer for both parties. ★ SUPERIOR COMFORT & QUALITY - these best seller Headset with mic features a pair of comfortable LEATHER PADS that will ensure a lasting comfort for the wearer. It comes with a durable slider and flexible headband that allows you to perfectly fit the headset without putting so much stress on your head. Pure comfort throughout your listening sessions is guaranteed. ★ USB CABLE ACCESSIBLE AND EASY TO USE CONTROLS - This PC headset will be an awesome addition to your computer gadgets at home & office. Featuring a 6-ft. USB flexible cable with easy-to-use volume / call answering / mute controls. With the accessible controls of this headset, you can now take calls, control your music with exceptional convenience. 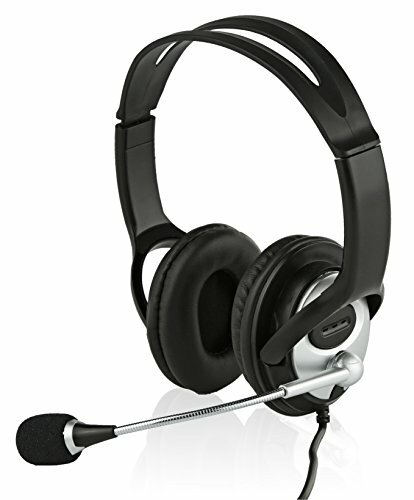 ★ EXCELLENT HEADSET BACKED WITH EXCELLENT SERVICE - Sonitum PC Headset is designed to meet the high standards of the headset market. Manufactures with the customer in mind. In fact, if your purchase comes with any sorts of defects or problems, do let us know. We offer you a 100% money back guarantee as well as a friendly team of customer support. We want to make sure that you get the best value for your money. If you have any questions about this product by Sonitum, contact us by completing and submitting the form below. If you are looking for a specif part number, please include it with your message.